Hi, i just got this player and i'm sure it's the best i have used on my Archlinux so far. I am a Winamp user in Windows, and was looking for a similar layout/organization, and this is the only player that lets me sort the artists by number of tracks(amount of tracks i mean). So, the thing i'm missing is that when i select an artist from a column, while having albums in other column, i want it to show just the albums from the artist i selected on the left. Is that possible? From what i have read on the guide, it should work like that if i select the artist column as the primary filter right? 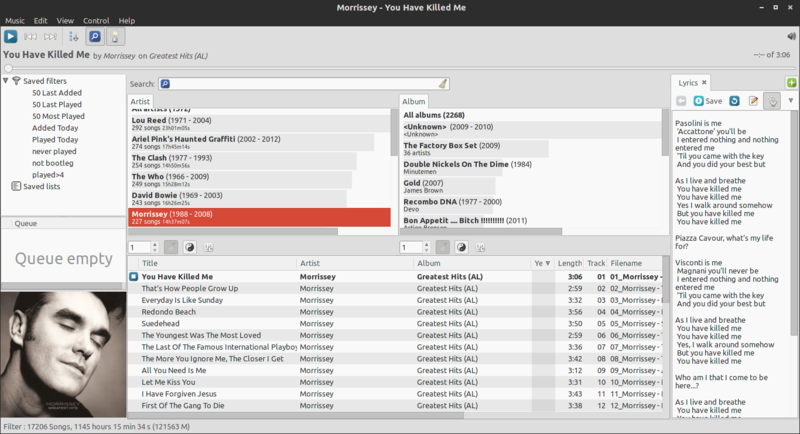 What i was expecting is the right column to show just the Morrisey albums instead of all the albums of my library. I hope somebody can help me out if this is already part of gmusic, and if not, i hope the dev could consider adding that. Re: Filters not connected to each other? Yes of course it should work like that. It doesn't work currently in some layouts like this one (rhythmbox) because they use the SongList with the playlist mode option (which makes it so that the list always displays the current playlist) and the FilterPanes (here the lists of Artists and Albums at the top) together, which as you can see currently doesn't work properly. In general, I don't recommend using the "make it look like" layouts, as by trying to look like other players, they usually fall short on some points, and do not feature some useful gmb-specific features. So you kind of get the worst of both worlds. Though one day they will be better.